For a limited Time you can get the "Discovery Pro Synth” - a 12 oscillator Virtual Analog Synthesizer featuring WAV and SoundFont (SF2) support. It also has Pad Resythesis, 2X oversampling /under-sampling, a built-in arpeggiator and sync among many other features. Heavily inspired by Clavia’s Nord Lead series, “Discovery Pro” is a synth capable of blistering basses, lush pads and scorching solo sounds. 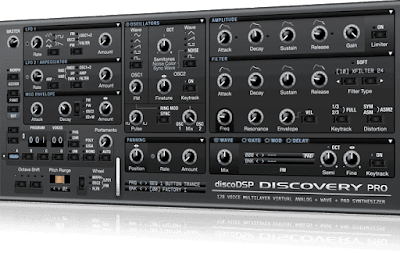 Capable of creating just about any synth sound, “Discovery Pro” comes with a huge selection of sound shaping tools including Parameter Morphing, 12 filter types and Graphic Envelope Modulation. Featuring more than 5000 inspiring presets in 60 Banks (including a percussion one) to get you started, this synth will provide endless hours of inspiration for your next track! 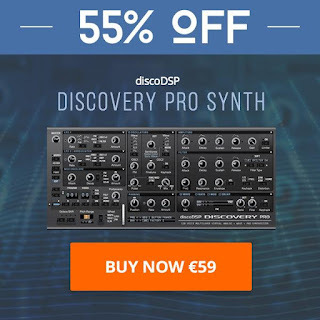 “Discovery Pro Synth” opens up a whole new world of sound design possibilities for your next track, thanks to it’s huge collection of Oscillator, LFO, Modulation, Gate and Morphing controls. Normally €129 – get it at 55% off before it’s gone! 55% off the normal price (normally €129)! Virtual Analog synthesizer + sampler. 32 / 64-bit Audio Units / VST / VST3. Multi-sized GUI (400p, 600p, 800p). 2x oversampling, 2x oversampled distortions. Zero Delay Nord Lead 2 and 12dB / 24dB Moog® modeled filters! Dual / Four octave key split. 4 layers / 12 oscillators with Sync / FM. WAV / SoundFont (SF2) support. Panning modulation / stereo delay / gate effects. Imports / Exports Nord Lead 2 SysEx data. Perfect for all types of music including Trance, Dubstep, Underscore, Chillout and Psytrance!